A mother describes life with a child with mild cerebral palsy. When our triplets were born at 27 weeks gestation in 1984, the odds were even that they would survive. The odds that they could lead normal lives were much less. We lost our sonon day 15 due to a rare heart condition, but the two girls survived. Both suffered the various preemie problems - patent ductus arteriosus (PDA), retinopathy of prematurity (ROP), jaundice plus others between the two of them. We were told to expect one of them (Jessie) to be mentally retarded. We did not expect the other one to be diagnosed later on with cerebral palsy. She seemed fine until around age 2 when she began toe walking and had some trouble with her right arm when using it to lift "heavy" objects. 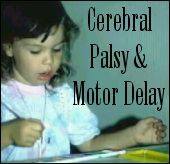 At age two the diagnosis of cerebral palsy was made. First, X-rays were taken by an orthopedist to make sure her hips weren't turned in. Next, a neurologist ran a CAT scan and MRI. Alicia began physical therapy (PT) and occupational therapy (OT) by the time she was 2 and a half and was placed in a plastic boot by a pediatric orthopedist for her right leg - the one with the worst pronunciation of toe walking. When reminded, she could put the foot flat but could not flex it any. After only a year in OT she improved her fine motor skills enough to be released. She still had the "shakes" when lifting anything over one pound with just her right hand. Even so, she was very successful at learning to write at only age 4. She wore the plastic boot until age 6 and was then released from PT and the Orthopedist. While we are very lucky that she suffered no mental problems due to her CP, the "mild" diagnosis has problems all it's own. Upon starting kindergarten, Alicia still had hand tremors and would walk on her toes if she forgot to put her feet down. A simple touch on her shoulder reminded her to walk flat footed. (Her teacher was wonderful to help with this.) Since another child in her kindergarten class suffered from a worse case (no early intervention either) of CP she was qualified to receive both OT and PT through the school. The teacher decided to have Alicia tested to see if she could receive the same. NOT - Alicia was already above "grade in all areas of education so this kept her from qualifying for any help. While I know it is wonderful that her mind was not affected in any way, it is to me very shameful that students who suffer some physical limitations are not allowed to receive help if they are not affected educationally. This is one of the biggest frustrations of the mild cerebral palsy diagnosis. As a parent who wants her children to be successful at all they try, it is hard to see her struggle to brush her long hair herself. It is very difficult to watch her eat without "reminding" her constantly to close her mouth when chewing, (this isn't bad manners, she literally can't seem to do it) or to take larger bites please!! She cannot pour herself a glass of tea or water if the pitcher is near full - it is too heavy for her. She has no real coordination when it comes to PE in school, but she tries and that is all that counts so far. She has made great strides though in one area - she plays the clarinet in band and worked so hard that she moved from 12th chair to 2nd this year. This to me is a major accomplishment!! It takes great dexterity of her fingers. The mild CP diagnosis is hard to live with when your child "appears" normal to most people. Teachers and friends wonder why she isn't able to do many physical tasks as well as she does educational tasks. This is where her self esteem is damaged!! It has been a struggle at times to reassure her that not everyone is "coordinated" anyway. For years she hated herself and hated it that she was the one to "get CP". After years of reminding her that she is a wonderful person no matter what, she is finally becoming a self-assured and happy child. I have to remind myself everyday how fortunate we are with both girls. The prognosis was not promising when they were discharged from the NICU. We are very blessed to have two very happy, healthy girls, and it is an added bonus that they are both successful in school. © René Z. Milner is the mother of triplets born at 27 weeks.